US/ FL/ Orlando/ Rosemont/ Lake Orlando – A Fantasy Air Allegro experimental airplane ditched to shoreline terrain of the Lake Orlando, due to an engine failure. No injuries. Congo DR/ Kinshasa-N'Djili Airport (FIH) - Malu Aviation Grumman G-159 Gulfstream I plane (9Q-CNP) sustained substantial damage in a landing accident. 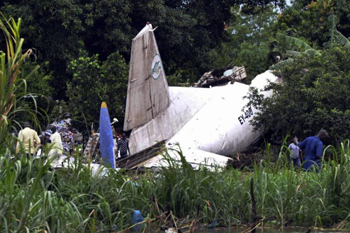 The aircraft suffered problems with the left hand main gear on takeoff from Kinshasa-N'Dolo Airport. The pilot apparently diverted to N'Djili. The aircraft landed gear up to the right side of runway 24. No injuries. Australia/ QLD/ 70km NW of Cairns/ Whyanbeel near Port Douglas – An Eurocopter AS 350BA Ecureuil (VH-SFX) crashed into a creek bed while conducting an aerial weed survey. The pilot was moderately injured and the other 3 occupants sustained minor injuries. Brazil/ SP/ Mirassol - A teenager died early on Monday after the crash of a trike-aircraft. UK/ Wiltshire/ MOD Boscombe Down – A Thales Watchkeeper WK450 Mk 1 military UAV (WK005) suffer extensive damage when it crashed on the runway on landing. No injuries. Canada/ BC/ Courtenay/ Courtenay Airpark (CAH3) - A Diamond DA40 Diamond Star plane (C-FOND) landed in the river with only the tail above the surface. Both pilot and passenger escaped uninjured. US/ OR/ Polk County/ Sheridan – An agricultural Bell 206B JetRanger II helicopter (N22743) impacted trees and terrain after a partial loss of power. The sole pilot onboard suffered minor injuries. US/ TX/ San Antonio International Airport – An ambulance Bell 407 helicopter (N496AE) made an emergency landing. No injuries. The helicopter was substantially damaged. Mali/ 2 km (1.3 mls) from Koussane - Senegalese Air Force Fokker F-27 Friendship 400M plane (6W-STF) sustained substantial damage in a forced landing accident. The aircraft force landed in field, causing the outer part of the left hand wing to break off. Two occupants are said to have sustained serious injuries. US/ OH/ Ravenna/ near Jetway Airport (61OH) – A powered parachute lodged in trees shortly after takeoff. The sole pilot onboard received minor injuries. US/ MI/ Tecumseh/ Meyers-Diver's Airport (3TE) – A Piper PA-18-150 Super Cub (N9029Y) impacted power-lines and trees during an apparent landing attempt. Both occupants received minor injuries. US/ MI/ Escanaba/ Delta County Airport (KESC) - A Denny Kitfox 2-3 plane (N93TG) force landed to airport terrain, due to a loss of an engine power. The airplane nosed over inverted sustaining substantial damage and the sole pilot onboard received minor injuries. Canada/ ON/ Haliburton/ West of Stanhope Municipal Airport (CND4) – A small plane impacted trees and terrain shortly after takeoff. Both occupants onboard received minor injuries. US/ AR/ Fayetteville – A Cirrus SR22 (N857SW) experienced a deployment of the Cirrus Airframe Parachute System (CAPS) over west Fayetteville, Arkansas. At least 2 occupants from the 4 onboard were taken to the nearest hospital with minor injuries. Australia/ WA/ Jandakot (YPJT) –A maintenance inspection of a Eurocopter AS 365N3+ Dauphin 2 (VH-WPX) revealed damage to a main rotor blade following a test flight. US/ WA/ near Sedro-Woolley – An agricultural Hughes 369D helicopter (N510PA) was substantially damaged during a forced landing following a loss of engine power. No injuries. Pakistan/ Lahore-Allama Iqbal International Airport (LHE) - Shaheen Air Boeing 737-4H6 (AP-BJO), operating flight NL142 from Karachi to Lahore, sustained substantial damage in a landing accident at Lahore-Allama Iqbal International Airport (LHE), Pakistan. At least 10 people received minor injuries. The two tires of the left hand main gear burst upon touchdown, causing the airplane to swerve off the runway. India/ 82 nm W of Mumbai – An Eurocopter AS 365N3 Dauphin 2 (VT-PWF) crashed in Arabian Sea while carrying out night landing practice at Bombay High, an offshore installation run by Oil and Natural Gas Corporation of India (ONGC). The helicopter took off from the ONGC SLQ installation at 19:12 and contact with it was lost eight minutes later. On Monday 9 November 2015 one body was retrieved from the sea. One occupant is confirmed to have died in the crash, the other person onboard is presumed to have died. US/ NY/ Queens/ Atlantic Ocean off Breezy Point – A Flight Design CTLS plane (N622BT) crashed into the sea. The pilot died. US/ OH/ Erie County/Wakeman Airport – A helicopter crashed about a half mile south of the airport in an agricultural field. The pilot was immediately taken by ambulance to a nearby hospital with non-life threatening injuries. The co-pilot was not seriously hurt. US/ AK/ north of Berners Bay/ Lynn Canal – A Cessna 180F Skywagon (N4611U) ditched as a result of engine failure. The 4 occupants were injured, one seriously. Syria/ northwest Hama/ near Sqelbiyeh town in Sahl Al-Ghab - Syrian Arab Air Force (SyAAF) MiG-21 fighter jet was downed in northwest Hama. The pilot died after the parachute failed to deploy. Crimea/ Klementieva Mountain – A Cessna 336 Skymaster (RA-67526) crashed. All 4 occupants onboard died. Costa Rica/ San Jose/ Tobías Bolanos Palma Intl. Airport – A Cessna 182 (TI-ANK) made a belly landing. shortly after takeoff from Juba Airport, South Sudan. at Juba Airport when it came down close to the banks of the White Nile. A Juba hospital director reported that 35 passengers and 6 crew members were killed. Two passengers survived the crash. В Южном Судане разбился самолет Ан-12. Он упал рядом с международным аэропортом Джубы, столицы Южного Судана - в 800 метрах от взлетной полосы. Как стало известно, самолет был перегружен почти в два раза. Перегрузка рассматривается в качестве основной версии авиакатастрофы. Самолет перед крушением летел к месторождениям нефти на реке Верхний Нил. Борт Ан-12 упал на небольшой островок, на котором проживает крестьянская община. Под самолетом оказались местные рыбаки, они погибли на месте. Камеры наружного наблюдения аэропорта в Джубе зафиксировали падение самолета. Кадры показал один из местных южносуданских телеканалов. На видеозаписи видно, как самолет взлетел и затем мгновенно упал, на огромной скорости ударившись о землю. После этого раздался взрыв и самолет охватило огнем. Всего при крушении погиб 41 человек, в том числе шесть членов экипажа - штурман из РФ и пятеро граждан Армении, а также жители деревни, на которую упал самолет. Двое выжили. типа Ан-12. Два других имеют регистрационные номера EY-402 (модификация Ан-12Б) и EY-409 (Ан-12БП). Транспортен самолет Ан-12ВК (EY-406) собственост на местната авиокомпания Allied Services Limited се е разбил секунди след излитането си от Джуба, столицата на Южен Судан. Съобщава се за 41 загинали и 2-ма ранени. Сред загиналите са 6-членният екипаж състоящ се от руснак и петима арменци, както и местни жители от риберското селище в близост загинали при падането на самолета. Основна версия за авиокатастрофата е претоварване на самолета. Spain/ 15 km SE of Zaragoza - Czech Air Force Mi-171S helicopter (9774) participated in a NATO training "Trident Juncture". The aircraft crashed injuring one crew member and four soldiers of 16 occupants onboard. US/ FL/ Stuart/ Witham Field Airport (KSUA) – A Beechcraft 76 Duchess (N18941) experienced a gear up landing, while practicing touch-and-go landings. No injuries. India/ Rajasthan/ Chandhan/ Jaisalmer - India Army DRDO Nishant UAV hit a tree and crashed. US/ GA/ Cornelia/ near Habersham County Airport (KAJR) – A Piper PA-28-180 Cherokee (N57WV) crashed in a foggy weather in a mobile home park adjacent to Habersham County Airport while arriving from Ft. Pierce, Florida. The 3 occupants onboard the plane died. France/ Gironde department/ Nouvelle-Aquitaine/ Andernos le bains – A training Robinson R22 Beta helicopter (F-GLSF) crashed. On return from a local flight, pilot stabilizes the hovering helicopter, turns round before starting a fast forward about 5 m height. After about 300 meters the pilot pitched up to stop hovering. He then receives a uncontrolled increase in engine speed and fails to reduce power. He loses control in rotation, the right skid struck the ground and the helicopter goes down on the left side. It was substantially damaged.The aircraft came to rest off the on the grass with a collapsed nose landing gear. Local media reports state the runway was wet due to rainfall. Argentina/ Corrientes Province/ Santa Ana – A training Cessna 150D (LV-CDV) crashed killing the 2 occupants onboard. US/ FL/ Okeechobee/ River Acres Airport (FD70) – A Zenith CH701 plane (N56553) impacted residential lawn terrain. The airplane was destroyed by the impact with terrain and subsequent fire. The sole pilot onboard the aircraft received fatal injuries. US/ LA/ Gonzales/ Louisiana Regional Airport (L38) – A training Cessna 120 (N2942N) sustained substantial damage during a force landing to open field terrain. The sole pilot onboard the airplane received minor injuries. Australia/ WA/ Newman/ Newman Airport – A Robinson R22 BETA helicopter (VH-NCL) collided with terrain shortly after take-off due to a gust of wind. The helicopter sustained substantial damage. No injuries. South Africa/ Eastern Cape/ Port Elizabeth/ Greenbushes – A Whisper Motor Glider (ZU-GAO) suffered an in-flight engine failure. The pilot carried out a successful emergency landing and escaped from the aircraft uninjured. The aircraft then caught fire and was completely destroyed apart from the tail section. South Africa/ Johannesburg/ Bordeaux/ Old Parktonian Sports Club – An ELA Aviacion ELA-07 gyrocopter (ZU-DLN) crashed. The pilot died. Australia/ VIC/ Mildura/ North of Mildura Airport (YMIA) - A Cessna 310R (VH-BWZ) clipped power-lines and impacted terrain while on approach. The airplane sustained substantial damage upon impact and was partially consumed by the post impact fire. The sole pilot onboard the aircraft received fatal injuries. US/ OR/ NW Lenanon/ Private Airstrip – A Van's RV-6A (N259MK) impacted the roof of a structure during a landing attempt. The airplane sustained substantial damage and the 2 occupants onboard received minor injuries. US/ GA/ Atlanta/ DeKalb-Peachtree Airport (KPDK) – A Cessna P210N Silver Eagle (N731LT) experienced a collapse of the left main landing gear upon landing. No injuries. Indonesia/ Yogyakarta-Adisutjipto Airport (JOG) - Batik Air Boeing 737-9GPER (WL) passenger plane (PK-LBO) was damaged in a runway excursion accident upon landing. The aircraft came to rest off the runway on the grass with a collapsed nose landing gear. Local media reports state the runway was wet due to rainfall. Philippines/ Sarangani province/ Malapatan - Philippine Air Force Bell UH-1D helicopter crashed on landing. All 9 occupants onboard were injured. Taiwan/ Cingcyuangang/Taichung Airport (RCMQ) - A National Airborne Service Corps (NASC) Beechcraft 300 Super King Air 350 plane (NA-302) crash-landed at Taichung's airport, but no one was injured in the accident. The twin-turboprop aircraft belly-landed at Chingchuangang Airport at about 1:50 p.m. after a landing gear failure. South Africa/ Eastern Cape/ Port Elizabeth Airport – A training Piper PA-28-180 Cherokee D (ZS-FHG) apparently suffered an engine failure on take-off. The pilot attempted to turn back, but collided with the western side of the airport perimeter fence and the aircraft caught fire and burnt out. The student pilot was fatally injured. US/ AK/ Eightmile Lake/ Eightmile Lake Airfield – An Aeronca 7BCM Champion plane (N3132E) nose over inverted during a landing attempt in deep snow. No injuries. Australia/ NSW/ Watagans National Park/ S of Cessnock – A Eurocopter EC 135T1 (VH-GKK) crashed. The 3 occupants onboard died. US/ CA/ San Jose/ Reid-Hillview Airport (KRHV) – A Cessna 172S Skyhawk (N21679) experienced a loss of directional control and subsequent runway excursion upon landing. The airplane came to rest inverted, sustaining substantial damage. One of the four occupants onboard received minor injuries. Slovenia/ near Slovenjske Konjice (NE) – A TL Ultralight TL-2000 Sting S4 aircraft (S5-PEI) crashed. Both occupants died in the crash. Germany/ Hopferau – An Avid Flyer IV (D-MBWS) fell about 150 meters from the sky, due to an engine failure. The pilot was severely injured. Austria/ HB Hofkirchen Airfield (LOLH) – A HB-Brditschka HB 23/2400 Scanliner motor-glider (OE-9484) burst into flames during the run-up check on ground. Both occupants managed to get out while the aircraft burned out completely. Argentina/ La Chiquita, near Tres Arroyos – A Schempp-Hirth Standard Cirrus VTC-75 (LV-DOC) crashed. The pilot died. Kuwait/ Mutlaa - An US Army drone crashed as a result of a technical malfunction. South Africa/ Johannesburg/ Midrand – A Cessna 172M Skyhawk (ZS-LKJ) stalled during an attempt to go-around and crashed into trees in the garden of a residence in Donovan Street in the suburb of Glen Austin. The front section of the aircraft caught fire and burnt out. The pilot was injured. Austria/ Lavanttal/ St. Andra/ Ragglach – An Aerostyle Breezer Club aircraft (D-MMJJ) crashed into a field after maneuvering at low altitudes and burst into flames. Both occupants (53 and 57) were killed in the accident. France/ Seine-Maritime – An small plane crashed. The pilot died in the crash. Venezuela/ zona del Chimanta Tepuy/ Yunek – A Cessna 206 (YV1811) took off and the pilot lost control of the aircraft due to strong gusts of wind hitting the trees in the area. The pilot died. Saint Lucia/ Saint Lucia-George F. L. Charles Airport (SLU) - Hummingbird Air Beechcraft 99 Airliner (N7994R) suffered a right hand main landing gear collapse on landing. Brazil/ MA/ Balsas – An Air Tractor AT-502 plane crashed just after takeoff. The aircraft caught fire. The pilot died. New Zealand/ Christchurch Airport (CHC) – A Van's RV-8 (F-PMHJ) suffered a nose gear collapse on landing. France/ Corse/ Propriano/ near Tavaria airport/ Valinco golf – A Wassmer WA 40A plane (F-BLFP) crashed into the sea shortly after takeoff due to an engine failure. No injuries. US/ CO/ Colorado Springs/ Colorado Springs Municipal Airport (KCOS) – A Cirrus SR22 (N752C) impacted open field terrain and a post-impact fire ensued. The 2 occupants onboard received fatal injuries. US/ GA/ 13 mls W of Cairo-Grady County Airport – Legal Airways LLC Cessna 441 Conquest II (N164GP) crashed. Both occupants were fatally injured. Weather may have been a factor to the accident. Canada/ ON/ Seguin Township/ Parry Sound – A Cessna 182H Skylane (C-GKNZ) impacted terrain just after takeoff and a post-impact fire ensued. The 2 related occupants onboard the airplane received fatal injuries. Italy/ Poggio Berni (RI) – A military Agusta-Bell AB 205A helicopter (MM80723/EI-35) impacted open field terrain and a post-impact fire ensued. The helicopter was destroyed and two of the four occupants onboard were seriously injured. Two of the occupants onboard the aircraft received minor injuries. US/ MO/ Ray County north of Richmond – A Cessna 182Q Skylane (N96381) crashed. The sole pilot onboard received fatal injuries. South Africa/ near Malakal Airport (MAK) - United Nations World Food Programme Hawker Siddeley HS-780 Andover C.1 (TL-AEW) crashed about 2 km from the runway into the Nile River shortly after takeoff. The 4 crew-members were taken to the UNMISS hospital in Malakal for medical checks. Brazil/ MG/ near Guarda-Mor - A Cessna 650 Citation VII (PT-WQH) was destroyed when it impacted a farm field. All 4 occupants onboard were killed. NTSB: On November 10, 2015, about 14:53 (EST), Execuflight flight 1526, a British Aerospace HS 125-700A (Hawker 700A), N237WR, departed controlled flight while on a nonprecision localizer approach to runway 25 at Akron Fulton International Airport (AKR) and impacted a four-unit apartment building in Akron, Ohio. The captain, first officer, and seven passengers died; no one on the ground was injured. The airplane was destroyed by impact forces and postcrash fire. The airplane was registered to Rais Group International NC LLC and operated by Execuflight under the provisions of 14 Code of Federal Regulations (CFR) Part 135 as an on-demand charter flight. Instrument meteorological conditions (IMC) prevailed, and an instrument flight rules (IFR) flight plan was filed. The flight departed from Dayton-Wright Brothers Airport (MGY), Dayton, Ohio, about 1413 and was destined for AKR. В американском городе Акрон, штат Огайо, потерпел крушение самолет British Aerospace BAe-125-700A (N237WR). Все девять человек, находившиеся на борту, погибли. Инцидент произошел неподалеку от международного аэропорта AKR около 15.00 по местному времени (23.00 мск). Самолет, падая, сорвал электрические провода, прошел насквозь через жилой дом и столкнулся с землей. Здание загорелось. Без света остались около полутора тысяч человек. По данным полиции, никто из жителей не пострадал. Сначала очевидцы услышали звук низко летящего самолета, затем был удар, столб черного дыма и пламя. Расследование установило, что катастрофа произошла из-за ошибки экипажа. Малък пътнически самолет - бизнес клас, BAe-125-700A (N237WR) на Rais Group International изпълняващ полет EFT1526 на авиокомпанията Execuflight е паднал върху къща в щата Охайо, САЩ, при подхода си за кацане на международното летище Акрон- Фултън (AKR). На борда е имало 9 души. Няма оцелели от тях. Няма пострадали на земята. Разследването установява, че катастрофата е причинена от грешка в пилотирането на екипажа, но заключава, че за това е допринесла и неадекватната политика на Execuflight по наемане, подготовка и оперативен контрол на действията на екипажа, за липса в авиокомпанията на програма по безопасността на полетите. Националното бюро по безопасността в транспорта (NTSB) критикува и Федералната авиационна администрация (FAA), че не е осъществявала достатъчен контрол върху работата на авиокампанията по безопасността. Slovakia/ Stretavka – A Ukrainian Mi-2 helicopter had been seen making an illegal flight over the border on Wednesday. It had performed "dangerous maneuvers" - flying at night in foggy conditions - in an apparent attempt to evade Slovakia's air traffic control system, but crashed. All occupants onboard were killed. Latest reports speak of 8 fatalities, the pilot as well as 5 men and 2 women from Afghanistan. France/ Verneuil-sur-Indre – A Verneuil-sur-Indre ultralight (37-AFH) collided with a powerline and crashed in a field. The pilot died. France/ Aix-Les-Miles Airfield (LFMA) – A training Guimbal Cabri G2 helicopter (3A-MIS) was damaged seriously during an exercise for an engine failure..
Australia/ QLD/ NW of Townsville/ Saunders Beach – A Cessna 172M Skyhawk (VH-EJM) force landed to bush land terrain due to an engine failure. The pilot received minor injuries. Ukraine/ 40 kms north of Zaporizhia – A Sukhoi Su-25M1 jet (07 BLUE) crashed during a training exercise. The pilot died in the crash. US/ ND/ Grand Forks Airport (GFK) - The Cessna 208B Grand Caravan, N617ST, tipped back and the tail struck the pavement while parked at the ramp at Grand Forks International Airport (KGFK), North Dakota. No injuries. US/ CA/ SW Lake Hughes – A Beechcraft A36 Bonanza (N78CR) force landed to rugged terrain. The 3 occupants received minor injuries. Australia/ NT/ Kiana Station, 90 km S of McArthur River Mine – An agricultural Robinson R22 BETA helicopter (VH-HWJ) collided with a tree and terrain. The pilot sustained serious injuries. France/ Le Touquet - Cote d'Opale Airfield (LFAT) – A Cessna 182K Skylane (F-BOJU) sustained an engine-failure shortly after take-off. The pilot managed to crash-land the aircraft in a field near the airfield. Iceland/ North Reykjavik – A training Tecnam P2002-JF plane (TF-IFC) impacted rugged lava terrain. The 2 pilots onboard received fatal injuries. US/ NC/ Jefferson/ near Ashe County Airport (KGEV) – A Cirrus SR22 plane (N334CM) experienced a deployment of the Cirrus Airframe Parachute System (CAPS) to open field terrain after a loss of engine power. No injuries. Brazil/ MT/ Paranatinga - A plane crashed and caught fire during an illegal flight. The pilot died. France/ Normandie/ Courseulles-sur-Mer/ Calvados - An ELA Aviacion ELA-09 Junior gyroplane (56-RF) crashed shortly after takeoff. The pilot died. US/ TX/ West of Alpine/ south of Abilene – A Robinson R44 Raven II (N449MC) clipped a tree while maneuvering over ranch. The helicopter came to rest on its side, sustaining substantial damage, and two of the four occupants onboard were seriously injured. Two of the occupants onboard the aircraft received minor injuries. Laos/ Vientiane-Wattay Airport (VTE) - Lao Skyway Xian MA60 passenger jet (RDPL-34226) suffered a runway excursion after landing. The aircraft operated flight LLL265 from Luang Prabang, Laos. UK/ Somerset/ near Churchinford/ Buttles Farm – A Piper PA-46-350P Malibu Mirage plane (N186CB) came down in a field. Pilot Philip Garvey, 56, his wife Ann, 55, and children Emily, 23, and Daniel, 20, who were onboard the plane, were killed. The AAIB accident report was published on 10-11-2016, and the following is the summary from that report: "The aircraft was approaching Dunkeswell Airfield, Devon after an uneventful flight from Fairoaks, Surrey. The weather at Dunkeswell was overcast, with rain. The pilot held an IMC1 rating but there is no published instrument approach procedure at Dunkeswell. As the aircraft turned onto the final approach, it commenced a descent on what appeared to be a normal approach path but then climbed rapidly, probably entering cloud. The aircraft then seems to have stalled, turned left and descended to “just below the clouds”, before it climbed steeply again and “disappeared into cloud”. Shortly after, the aircraft was observed descending out of the cloud in a steep nose-down attitude, in what appears to have been a spin, before striking the ground. All four occupants were fatally injured. The investigation was unable to determine why the aircraft made the initial rapid climb but there was some evidence to suggest that the pilot may have manually overridden the autopilot, during the initial descent, without realising it was still engaged. This would have caused an out-of-trim condition that could have contributed to the aircraft pitching up rapidly. Evaluation flights showed that the pitch attitude achieved during this manoeuvre would have been disorientating for the pilot and may explain why control was not regained." Spain/ off Gorliz – A Cessna 172N Skyhawk II (EC-HKH) ditched off Gorliz, Spain, due to an engine failure. All three on board were rescued. US/ TN/ Union City/ Everett–Stewart Regional Airport (KUCY) - An experimental unregistered Rans S-5 Coyote I impacted roadway terrain during a force landing attempt while on approach to KUCY. The sole pilot onboard received serious injuries. France/ Nordhouse - An experimental HKW-Aero HKW-01, registered WHKW01, crashed in a field near Strasbourg Airport. The pilot died. US/ TX/ Missouri City/ Fort Bend County/ Sugarland/ Pelican Landing – A Robinson R22 Beta helicopter (N7058Z) experienced a hard landing during an auto-rotation. The sole pilot was seriously injured. US/ WI/ Shawano/ about 8 miles south of Shawano Municipal Airport (KEZS) – A training HICKHAM LANCAIR IV-P plane (N10UU) impacted farm field terrain. The 2 pilots onboard received minor injuries. The National Transportation Safety Board determines the probable cause(s) of this accident to be: A total loss of engine power due to a dual magneto failure, as a result of an exceedance of the engine's operating limitations while maneuvering. Russia/ Khanty-Mansi Autonomous Okrug/ 8 km from Andhra – Utair Mi-8 helicopter made a hard landing, causing a broken beam, damaged fuel tanks. No injuries. Russia/ Tomsk Oblast - Avia Sibir Mi-8 helicopter made a hard landing. The helicopter’s tail rotor was damaged. No injuries. Romania/ Nucet – A Pipistrel Sinus plane (YR-5454) was struck by a gust of wind and crashed. The pilot was seriously injured. Malaysia/ Pulau Pangkor/ Kampung Tersusun/ near Teluk Dalam beach – A Piper PA-32-300 plane (9M-AVN) crashed by the seaside following a loss of engine power just after takeoff. The pilot proceeded to an emergency ditching. All four occupants received minor injuries. Japan/ Sendai Airport (SDJ/RJSS) – A Beechcraft A36 Bonanza (JA3762) made a belly landing while the first attempt of five touch-and-go training. No injuries. The pilot reported that he forgot to extend the landing gear. US/ NM/ near Sandia Crest north of Tijeras – A Cessna 182G Skylane (N2440R) impacted mountainous terrain. The 3 occupants onboard received fatal injuries. Weather may have been a factor to the accident. Mexico/ Ixtapa/Zihuatanejo Internacional Airport (ZIH) - Servicios Aereos Estrella (SAE) Learjet 60 (XA-UQP) suffered a runway excursion upon landing. The left main landing gear was torn off and the left wing and flap were damaged. Australia/ NSW/ The Pilliga – An Eiri-Avion PIK-20B glider (VH-GTV) crashed during a championship. No injuries. US/ TX/ Austin-Bergstrom International Airport (KAUS) – A Cessna 177RG Cardinal (N8035G) experienced a landing gear collapse upon landing. No injuries. Colombia/ Acandí/ Choco – A Cessna 402B (HK-4981G) crashed. The aircraft was chartered with several baseball players onboard from Medellín to Acandí. The pilot and one of the passengers died in the accident. The other 8 baseball players onboard were injured and hospitalized. Colombia/ near Cali-Alfonso Bonilla Aragon Airport (CLO/SKCL) – A Piper PA-34-220T Seneca (HK-4483G) crashed on landing, injuring all 3 on board. Nicaragua/ Southern Nicaragua/ San Juan river/ near Santa-Fe bridge – A Bell 206L-4 LongRanger IV helicopter (YN-ISA) crashed on takeoff in poor visibility. Ex-minister of the presidency, Antonio Lacayo Oyanguren was on board with two Americans. Three occupants died and one is missing. US/ CA/ Carlsbad/ McClellan-Palomar Airport (KCRQ) – A Eurocopter AS350 Écureuil (N711BE) spun out of control and caught fire while landing at KCRQ. The 2 occupants onboard the aircraft received fatal injuries. The pilot was identified as Bruce Allen Erickson, 65, of Rancho Santa Fe. His passenger was identified as Wayne Frank Lewis, 60, of Cardiff by the Sea. US/ AK/ Middleton Island/ Middleton Island Airport (PAMD) – A Piper PA-31-350 Navajo Chieftain (N46FA) collapsed the gear on landing. No injueies. Switzerland/ VD/ Bex airfield (LSGB) – A training Extra EA-200 plane (HB-MSW) experienced an engine problem during touch and go. Pilot used breaks to stop the plane. The aircraft hit trees around the airfield. Both occupants onboard were slightly injured. US/ CA/ La Verne/ Brackett Field Airport (KPOC) – A Cessna T210N Centurion (N91HC) lost an engine power on approach. The airplane impacted terrain inverted subsequent to contact with signage and an airport perimeter fence. The aircraft flipped before it burst into flames. No injuries. US/ CA/ Roger Dry Lake - US Air Force Research Laboratory Lockheed Martin X-56A UAV crashed on its 17th flight, its first flexible-wing flight to test active flutter suppression flight. Canada/ ON/ Griffith Island/ Georgian Bay – A Pilatus PC-12/47E (C-GECT) had been damaged during a hard landing when a wing struck the ground. No injuries. Australia/ QLD/ 8km NNW of Cecil Plains – A Jabiru J430 plane (VH-SZQ) experienced an engine failure in which the pilot conducted a forced landing on a road, resulting in substantial damage. Germany/ Straubing Airport (EDMS) – A Piper PA-31T1 Cheyenne (N191MA) suffered a gear-up landing when a pilot of a maintenance service shop conducted a check ride after completing the 100h inspection. Gear extended and locked normally when the aircraft was recovered. China/ Zhejiang Province/ Anji County – A military Chengdu J-10A jet crashed. The pilot, Lu Yaogui, ejected but later died due to his injuries. Guatemala/ Xejuyup San Felipe/ San Andres Xecul – A Piper PA-28-235 (TG-CHO) struck house and impacted a field. Two persons inside the house were injured, the pilot and the two passengers were hurt too. US/ NY/ North Salem/ Titicus Reservoir – A Beechcraft F33A Bonanza (N9318Q) impacted the waters of Titicus Reservoir in North Salem, NY, while on approach to Danbury Municipal Airport (KDXR), Danbury, Connecticut. Aircraft debris has been located. The aircraft was destroyed. The two occupants onboard received fatal injuries. Weather may have been a factor to the event. Portugal/ Ponte de Sor – A training Schweizer 269C helicopter (G-STEP) crashed 2 kilometers from the Ponte de Sor airfield, on an open area when flying at low altitude, during an attempt for an emergency landing, after a collision with electric wires. A 22 year old Angolan woman, taking lessons, was flying alone. She was taken to hospital seriously injured, after leaving the aircraft by her own. US/ FL/ Orlando/ Orange County/ Clear Lake – A Beechcraft A36TC Bonanza (N7FG) impacted the waters of Clear Lake SW of Orlando Executive Airport (KORL), Orlando, Florida. The pilot had reported problems with the autopilot system. The two occupants onboard received fatal injuries. Malaysia/ Johor/ Kulai/ Senai/ Senai golf course – A training Piper PA-28-181 Archer III (N9297N) crashed on golf course during training flight due to engine problems. The pilot (30) was injured. He was taken to hospital. New Zealand/ South Island/ Westland/ Fox Glacier/ NE of Karangarua – An Aerospatiale AS 350BA Ecureuil helicopter (ZK-HKU) went down around 10 a.m. NZDT Saturday (4 p.m. EST Friday) on Fox Glacier on the West Coast of New Zealand's South Island. The glacier is in the Westland Tai Poutini National Park. Four United Kingdom citizens and two Australians were believed to be passengers on the flight along with a local pilot, police said in a news release. The seven occupants (one pilot and 6 tourists) received fatal injuries. Low clouds and rain showers were in the area. Iran/ South-west of Iran/ Shush – A military drone crashed. US/ NC/ Union County/ west of Unionville – An experimental Phantom X-1 aircraft (N28365) experienced an apparent stall and impacted open field terrain. The sole pilot onboard received serious injuries. Guatemala/ Guatemala City/ La Aurora International Airport (MGGT) – A Piper PA-31 (C6-TAK) impacted roadway terrain shortly after takeoff. The airplane was consumed by the post impact fire and the two occupants onboard received minor injuries. US/ WA/ Everett/ Snohomish County Airport-Paine Field (KPAE) – A Beech G18S plane (N9669R) experienced a collapse of the right main landing gear upon landing. No injuries. Norway/ Vestfold/ Sandefjord Torp airfield – A training Robinson R22 Beta helicopter (LN-OZP) overturned on landing. No injuries. US/ MD/ Anne Arundel Co/ Fort Meade/ Tipton Airport (KFME) – A Mooney M20E Super 21 plane (N5512Q) force landed to airport terrain adjacent to the runway due to a loss of engine power. No injuries. US/ GA/ Rome/ Richard B Russell Regional Airport (KRMG) - A Cessna 441 Conquest II (N441TN) experienced a nose gear collapse during a precautionary landing at the airport KRMG. No injuries. Japan/ Gunma prefecture/ Annaka city/ Matsuidamachihara – A Robinson R22 Beta helicopter (JA7963) crashed near an expressway in a mountainous area. Both occupants onboard died. Taiwan/ Banqiao District/ New Taipei City/ 8 nm SW of Taipei Songshan Airport – A Bell 206B JetRanger II helicopter (B-31127) collided with power cables and crashed. Both occupants onboard died. US/ CO/ Hudson/ Weld County near Platte Valley Airpark (18V) – A Beechcraft 56TC Baron (N12WB) experienced a runway overrun during an aborted takeoff. No injuries. Kyrgyzstan/ Osh Airport (OSS) - Avia Traffic Company Boeing 737-3Y0 (EX-37005), flight YK768, sustained substantial damage in a runway excursion accident. The left hand main landing gear and no.1 engine broke off. US/ NY/ Albany/ Albany International Airport (KALB) – A Beechcraft 95-B55 Baron (N12WB) experienced a nose gear collapse upon landing. No injuries. UK/ Lincolnshire/ Gainsborough/ East Barkwith/ Lodge Farm – An ARV1 Super 2 aircraft (G-BPMX) made a forced landing in a field due to an engine failure. The aircraft struck a tree stump and was badly damaged but the pilot was uninjured. South Korea/ Gangwon Province/ Wonju County - Two U.S. pilots were killed Monday when a military helicopter crashed near Wonju, South Korea, during a routine training mission, the Pentagon said. The AH-64 Apache (08-05562), which crashed about 50 miles east of Camp Humphreys, belonged to the U.S. Army's 2nd Infantry Division, Republic of Korea/U.S. Combined Division. According to South Korean authorities apparently helicopter crashed into a high-voltage wire or power line pole. Among the debris were visible pieces of wire. US/ TX/ Fort Hood - US Army, 291st Aviation Regiment, Sikorsky UH-60A Black Hawk helicopter (87-24651) crashed during a training exercise. The pilot in charge at the time executed a “break turn” at 120kts and 300ft according to the First Army 15-6 internal investigation, which (at 60 degrees) exceeded the aircraft’s maximum angle of bank. The helicopter quickly lost altitude and the crew was unable to recover before the helicopter’s tail hit a tree, causing catastrophic damage to the airframe. All 4 crew members died. India/ Jammu and Kashmir/ Udhampur district/ near Katra - Himalyan Heli Services Eurocopter AS 350B3 Ecureuil (VT-JKB) crashed shortly after takeoff. It was ferrying pilgrims from Katra to the helipad at Sanjichat which serves the Vaishno Devi temple. Witnesses stated that a bird hit the tail rotor. 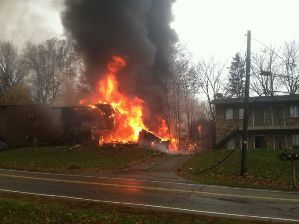 While the pilot was trying to make an emergency landing, the helicopter hit power lines and caught fire. The Chib family residing in the Gho Manasa area in the outskirts of Jammu city were in celebratory mood after the wedding of their only son but all this turned into a pall of gloom on Monday as three members of the family including the newlyweds were among the seven killed in the helicopter crash at Katra. Italy/ 12 Nm North off Stromboli – A SG Aviation Storm 300 plane crashed into the sea. Both occupants - father (61) and son (26) - died in the crash. Slovakia/ near Sumiac/ 150 meters from summit of Kraiova hola mountain – A Diamond DA20-A1 Katana plane (OM-PMT) crashed. Two people - man and the woman - are reported injured. Pakistan/ Mianwali/ Kucha Gujrat - One of Pakistan's few female fighter jet pilots was killed. Flying Officer Marium Mukhtiar and Squadron Leader Saqib Abbasi were flying a training mission on an Chengdu FT-7PG jet (03-689) and encountered a "serious in-flight emergency" during the final stages. The crash took place in Kundian, Mianwali district, about 175 kilometres (109 miles) SW of Islamabad. The male officer, Abbasi, sustained minor injuries. In order to ensure the safety of civilians on the ground, they were forced to eject and the aircraft crashed. Mukhtiar's body was flown to an air force base in Karachi where a ceremony was held for her late Tuesday. Afghanistan/ N Afghanistan/ Faryab province - Helicopter type Mi 17-1V (reg. number ER-MGM; c/n 96621) operated by Moldavian Air company “Valan International Cargo Charter” worked in Afghanistan under contract with "AIRCRAFT CHARTER SOLUTIONS" UAE, for the prime contractor of United States Government (USG), MAG DS CORP. Helicopter was providing civil airlift support for Afghan National Security Forces. Helicopter arrived in Afghanistan on 30th of October 2015 and was based in Mazar-I-Sharif, Afghanistan. On 24th of November helicopter with 3 crew members was operating a scheduled mission transporting 18 afghan personnel. At approximately 15:30 local Afghanistan time a "MAY DAY" call was received from the helicopter crew, informing that the helicopter has been hit, is down, and on fire. According to preliminary information the helicopter has performed an emergency landing. Taliban insurgents ambushed the helicopter killing 3 people in a shootout and capturing at least 16 others who were on board. Repatriation of the body of the deceased pilot was held on December 17 at 04:30 in the morning, near the Chisinau International Airport, after the joint efforts of the Moldavian authorities and and air company "VALAN ICC". A medical examination conducted by foreign institutions in Afghanistan, confirmed that the victim is a citizen of Republic of Moldova, Oleg Groza. Afghanistan/ near Bagram Air Field - USAF, 451st Air Expeditionary Group, MQ-9 Reaper drone crashed. US/ LA/ Sulphur/ Southland Field Airport (KUXL) – A Cessna 305A (N5312G) force landed to brush field terrain near the perimeter fence of Southland Field Airport (KUXL), Louisiana. The airplane sustained substantial damage and the 2 occupants onboard received minor injuries. US/ ME/ Biddeford/ Biddeford Municipal Airport (B19) – A Mooney M20E Super 21 airplane (N9301M) experienced a gear up landing. No injuries. US/ NE/ Hayes County/ south of Hamlet – A Cessna 182D Skylane (N8983X) experienced a loss of directional control and subsequent runway excursion upon landing at the pilot/owner's private turf landing strip. The airplane nosed over inverted sustaining substantial damage. No injuries. US/ GA/ Lawrenceville/ NE of Gwinnett County Airport (KLZU) – A training Piper PA-28-180 Cherokee (N3971R) force landed to residential roadway terrain. The airplane sustained substantial damage and the 2 occupants onboard received non-life-threatening injuries. India/ Nagaland's Phek district/ Meluri helipad - Pawan Hans Helicopters (PHHL) SA 365N2 Dauphin 2 helicopter (VT-ELJ) made a crash landing. Helicopter rear portion caught fire after landing and destroyed. The accident happened because there was "no visibility while landing due to extreme dust," a government official said on condition of anonymity. All 6 persons onboard were injured, two of them seriously. Those injured included officials of the state government and that of the National Disaster Management Authority. US/ CA/ Santa Monica/ Sepulveda Pass – A training Robinson R22 Beta helicopter (N346VH) suffered an impact with an undetermined object in-flight. The flight instructor, on the left seat, sustained cuts on his hands and knees. There were no feathers or blood on the windscreen. The pilots diverted to Van Nuys airport, and landed safely. LA Helicopters chief pilot, Guillaume Maillet said the windshield was severely damaged. The impact created a big hole in the bubble, and the instructor pilot suffered cuts on his hands and knees when the Plexiglas windshield broke. He thinks, because of the lack of feathers or blood on the windshield, it was a drone. A Russian Su-24M bomber (RF-90932/83 W; 26 WHITE) was shot down by a Turkish F-16 fighter jet in Syria near the border with Turkey. The Navigator/pilot was saved by Russian/ Syrian Special Forces. The Captain of the SU-24, Oleg Anatolievich Peshkov, was killed by terrorist group armed with machine guns as he was descending on the parachute after both pilots ejected. A Russian pilot who was rescued after his plane was shot down by Turkey claims that he was not given any visual or audio warning. The United States believes that the Russian jet shot down by Turkey on Tuesday was hit inside Syrian airspace. Unverified - audio recording has emerged with Turkish authorities telling the pilot he was approaching Turkish airspace, but they did not say at what frequency radio message was broadcast. Russian soldier named Alexandr Pozynich was killed during the 12-hour operation to rescue ejected Russian pilot. Vladirmir Putin said: “Today’s loss was a stab in the back by the accomplices of terrorists. Our pilots and our aircraft never threatened the territory of Turkey. That much is obvious." US/ NM/ NW of Salinas Peak - A US Air Force, 314-th Fighter Squadron, F-16C Block 42C training fighter jet (88-0487) experienced a successful ejection of its pilot. The airplane was destroyed. No injuries. Germany/ near Lindewitt – A Piper PA-28-180 Cherokee Archer (D-EHPD) crashed into trees killing the pilot. South Africa/ Gauteng/ Alberton/ Kromvlei flying area – A Bell 407 helicopter (ZS-RRJ) suffered an extremely hard landing on an open piece of ground. The skids collapsed, most of the windows broke, some of the doors fell off and the main rotor suffered a partial collapse. The pilot suffered a spinal compression injury and was airlifted to hospital. US/ KS/ Wichita/ Colonel James Jabara Airport (KAAO) – A Beechcraft 95 Travel Air (N2021C) experienced a landing gear collapse upon landing. No injuries. Venezuela/ Caracas-Simon Bolívar International Airport (CCS/SVMI) – A Hawker Siddeley HS-125-400A (YV1687) landed gear-up. The aircraft operated on a flight from Valencia to Panama when it developed problems with the undercarriage, forcing a diversion to Caracas. Mexico/ Mexico City-Benito Juarez International Airport (MEX) – Magnicharters Boeing 737-322 passenger plane (XA-UNM), operating flight GMT779 from Cancun, collapsed the left hand main landing gear, while the aircraft landed on runway 05L. Russia/ Krasnoyarsk Krai/ 10 km from Igarka – OOO AK Turuhan Mi-8T helicopter (RA-25361) carrying 22 passengers and three crew members crashed 10 kilometers from the town of Igarka, Russia. As a result, 12 people died, and another 12 are in intensive care. Reportedly the helicopter fell into the ice covered Yenisei River. Экипаж вертолета Ми-8Т (RA-25361) выполнял транспортно-связной полет по маршруту Игарка - НПС-2 (нефтеперекачивающая станция нефтепровода Ванкор - Пурпе) - Красноселькуп - Игарка с целью доставки вахты. На борту находилось 22 пассажира, 3 члена экипажа и груз (личные вещи) весом 250 кг. Взлет в а/п Игарка произведен в 10:57 местного времени. Вскоре после взлета вертолет потерпел катастрофу на льду реки Енисей в 2100 м от КТА аэропорта. Вертолет полностью разрушен, пожара не было. 7 пассажиров и 3 члена экипажа погибли, остальные пассажиры получили ранения. Двое пострадавших скончались в больнице через трое и четверо суток после происшествия. Место АП расположено на удалении 1250 м от правого берега и в 1650 м от левого берега реки Енисей. Полет проходил над заснеженной безориентирной местностью при следующих фактических метеоусловиях: ветер 140° 5 м/с, видимость 6000 м, облачность 7 октанов, кучево-дождевая высотой 660 м, ливневый снег, температура воздуха +15°С, давление 748 мм рт.ст. Согласно предварительной расшифровке СОК, примерно через 1 минуту 30 секунд после взлета, на высоте около 100 м, у вертолета стал развиваться правый крен. Особая ситуация была идентифицирована экипажем как отказ автопилота в канале крена (согласно расшифровке записи МС-61). Вертолет перешел в снижение. Правый крен к моменту прекращения записи составлял около 50°. Столкновение с ледовой поверхностью произошло со значительной поступательной скоростью. Разрушаясь, вертолет продвинулся на расстояние около 100 м и остановился с креном на правый борт. Chile/ Bio-Bio/ Duqueco/ NE of Santa Barbara – A Cirrus SR22 GTSx Turbo plane (CC-ADS) collided with trees on landing. The pilot and owner Carlos Marin and his wife suffered minor injuries; the other 2 occupants on the back seats were uninjured. Egypt/ Cairo – An Egyptian Air Force Mi-17 helicopter (3288) was conducting a surveillance mission when a “technical malfunction” caused it to suddenly lose altitude in a rural area in Giza governate. At least one occupant was injured. Australia/ QLD/ about 40 kilometres south-west of Townsville/ Woodstock – A LightWing 912s aircraft (25-3370) crashed on takeoff. The pilot died. Russia/ Khanty-Mansi Autonomous Okrug/ near Kedrovyy – A Eurocopter AS 350B3 Ecureuil (RA-04037) crashed into river Ohlym. The 4 occupants onboard died. Austria/ Wiener Neustadt Ost Airfield (LOAN) - A Diamond HK-36TTC-115 Super Dimona plane (OE-9505) flipped over due to a strong gust of wind and it was completely destroyed at the airport. Brazil/ RS/ Sao Vicente do Sul – An agricultural EMB-201A plane (PT-GTR) crashed. The pilot died in the crash. US/ CA/ Avalon/ Catalina Airport (KAVX) – A Cessna T210N Turbo Centurion (N99210) experienced a runway overrun upon landing. The airplane came to rest inverted, sustaining substantial damage. No injuries. US/ VA/ West Point/ West of Middle Peninsula Regional Airport (KFYJ) – A Grumman AA-5B Tiger (N28295) crash landed in a marsh. No injuries. Russia/ Kamchatka Krai/ Yelizovo – A Mi-2 helicopter (RA-23786) made a hard landing. Landing gear collapsed. One of the occupants received fatal injuries and the other 2 onboard were injured. US/ CO/ Denver/ SE of Centennial Airport (KAPA) – A Pipistrel Virus light sport aircraft (N145VS) force landed to open field terrain. The airplane sustained substantial damage. No injuries.